Saturday we drove through Idaho to Boise. We stopped and met up with a friend I had made when I lived in Boise last Spring. We had a nice dinner in downtown Boise. We were considering motoring on a bit further, but we were both pretty sleepy by then so we grabbed a motel for the night and headed on in the morning. Sunday we ate breakfast in Baker City, Oregon and then drove along the Columbia River Gorge to Portland, arriving about 3:00 pm. First order of business was putting some air into Bernie's visitor bikes and then getting some much-anticipated bubble tea at Fat Straw. We cruised around the Hawthorne neighborhood a bit, stopping at The Dollar Scholar and then picked up some food for dinner. We had Buffalo style tempeh using Bernie's recipe, along with some millet and khale and coconut ice cream for dessert. Yum. Monday Bernie and Andrew were both working so I went again to Fat Straw to read in the morning then took a nice yoga class at Yoga Union. Andrew and I got some yummie but huge burritos at Los Gorditos taco cart for lunch then biked down around Ladd's Addition, down to Oak Bottom Wildlife Refuge, and over the Steel Bridge to look at the cherry blossoms. We met up with a bunch of Bernie's crew and had dinner at Hot Lips Pizza. Afterward we rode around a bit and made our way to the esplinade to chat and hang out under the cherry blossoms. Today Andrew and I went to an introductory Vinyasa 101 class followed by lunch at Paradox Cafe. 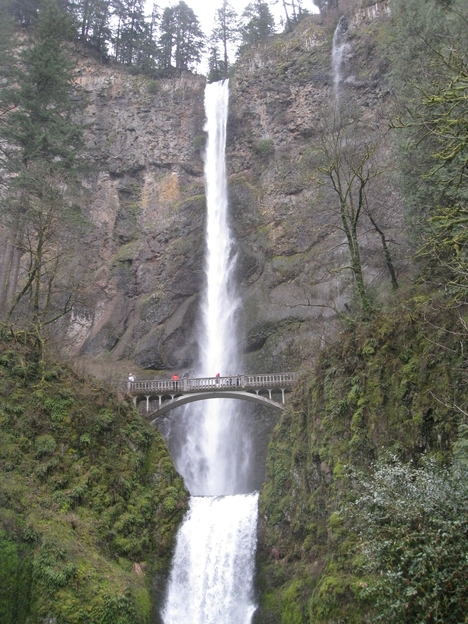 After a brief rest we drove out to Multnomah Falls and hiked up to the top. It was a fairly amusing crowd on the paved but steep pathway to the top. There were ample tourists, pregnant women, couples with infants, couples pushing toddlers in strollers, various PDX hipster urban types, some guy wearing a weight vest and ankle weights, and overweight people huffing their way up. Tonight we biked to Dot's Cafe in the Clinton District for a very tasty meal. Pictures so far are here .